It can be challenging to feed your family healthy meals on a tight budget. This cookbook is intended to help you make the most out of foods that you’ll find at a local food pantry. You are welcome to download it, print it, and share it with your families, colleagues, and friends. And remember to take the time to sit down and eat at a table, turn off the TV and cell phones, and enjoy your food! These recipes and food tips have been compiled with help from the Greater Pittsburgh Community Food Bank, Mid-Michigan District Health Department, and MSU Extension. 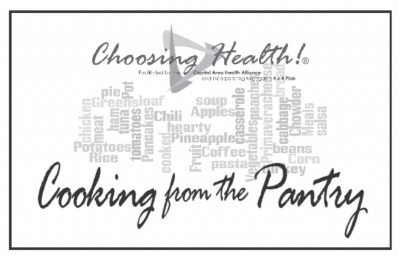 The Cooking from the Pantry Cookbook was produced by the Capital Area Health Alliance through the Michigan Health and Wellness 4 x 4 Grant as well as the generous printing donation of ASAP. Over 14,000 cookbooks were distributed to Tri-County area food pantries and community organizations by the Alliance and its partners. Sponsoring Organizations: ASAP Printing, Barry-Eaton District Health Department, Capital Area Health Alliance, Mid-Michigan District Health Department, Lansing Community College, MI Healthier Tomorrow, MSU Extension, and NexCare Health Systems.